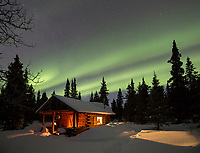 The aurora borealis swirling over a remote log cabin presents a classic view of rustic life in Alaska. Many of the cabins are used for recreational purposes and are accessed in winter by skis, dogsled, or snow machine. The pictures here were taken throughout Alaska, many of which are off the grid without electricity. next » | 157 sample images from this category. Try a keyword search to see them all. Aurora over wolf run cabin in the White Mountains National Recreation Area. 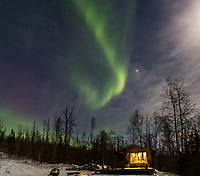 Aurora borealis and boreal forest in Fairbanks, Alaska. Tolovana Hot Springs, Interior, Alaska. 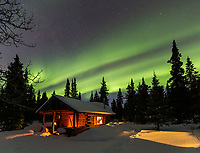 Aurora borealis over a log cabin in the boreal forest of Fairbanks, Alaska.